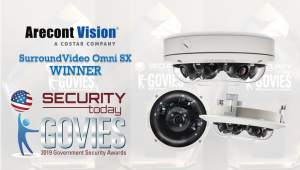 LAS VEGAS, NV, USA, April 10, 2019 /EINPresswire.com/ — Arecont Vision Costar, the leader in network-based video surveillance solutions, has received a 2019 Government Security Award (a “Govie”) for a new advanced camera model at the ISC West security conference and exposition. The SurroundVideo® Omni SX will be among several new camera models demonstrated in the Costar Technologies, Inc. booth (#8045), Sands Convention Center, Las Vegas, Nevada, from April 10th through the 12th. The compact, low-profile SurroundVideo Omni SX is the newest member of the proven family of omni-directional, adjustable view dome surveillance cameras that the company pioneered for the security industry beginning in 2014. The new multi-sensor camera series builds upon the global success of the Omni G2 in offering both 12 and 20MP models. Each feature True Day/Night capabilities for indoor/outdoor usage, including Advanced Wide Dynamic Range (WDR) for varied lighting conditions and NightView™ technology for strong low-light performance. Built-in SNAPstream™ technology reduces bandwidth without sacrificing image quality. The 4-sensor, user-configurable Omni SX camera series features the customer’s choice of remote focus lens options ranging from 2.1 to 16mm. An independent panel of judges from the security industry selected the top entries in the 2019 competition sponsored by 1105 Media. The Omni SX and other award recipients were named across multiple categories using criteria that included Features, Innovation, User Friendliness, Interoperability, Quality, Design, Market Opportunity, Impact in the Security Industry, Technical Advances, and Scalability. Visit the Costar Technologies, Inc. booth (#8045) at ISC West to see this exciting new addition to the Arecont Vision Costar Total Video Solution™, plus other new cameras and technology demonstrations. CohuHD Costar and Costar Video Systems will also be displaying new products and will join with Arecont Vision Costar team members in answering any questions attendees may have. Arecont Vision Costar, LLC, a Costar Technologies, Inc. company (OTC Markets Group: CSTI), is the leading US-based manufacturer of high-performance IP cameras and video surveillance solutions. We are focused on providing the best customer service, product reliability, and product innovation. We offer the Total Video Solution composed of superior megapixel cameras (MegaIP™ & ConteraIP™), advanced ConteraVMS® video management system, ConteraWS® (cloud-based web services), and ConteraCMR® (cloud-managed video recorders) for both local and cloud-based video surveillance. Most Arecont Vision Costar products are Made in USA. 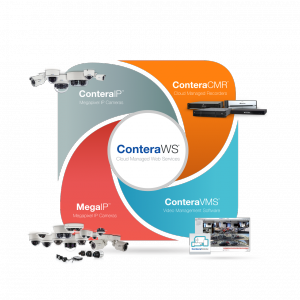 We support integration with leading 3rd party products via ONVIF compliance and go beyond via the Arecont Vision Costar MegaLab™.